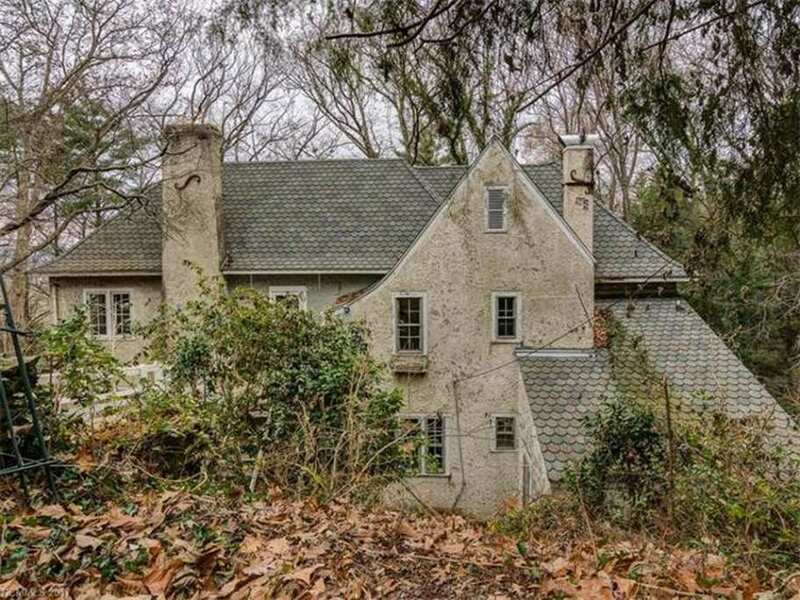 Historic Grove Park home ready for major rehab! 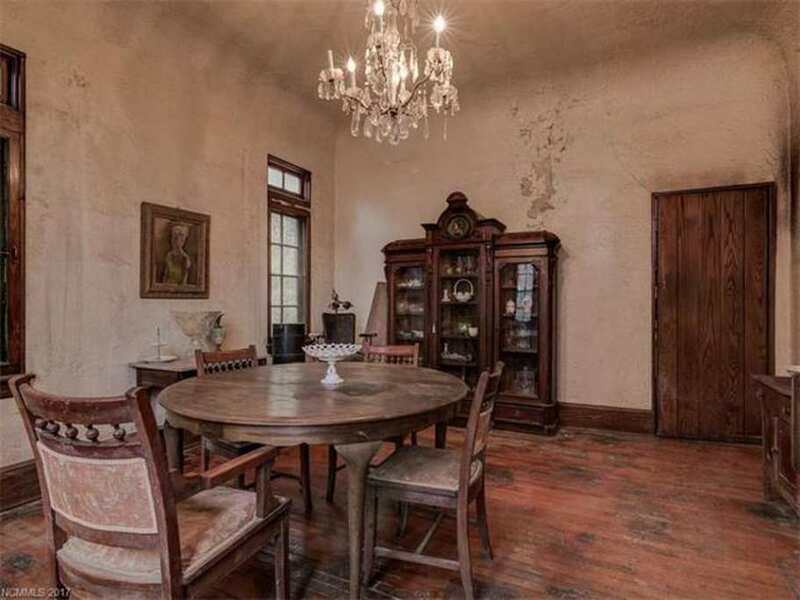 Grand spaces, high ceilings and many original finishes and features intact. Incredible potential for right buyer who can handle major level work. Currently a 4 bedroom home - would be ideal 3 bedroom post remodel. Also has basement quarters which could become great home stay, in-law or guest suite. Will be full major remodel requiring all systems to be replaced and all surfaces touched. Preservation restrictions will be in place. 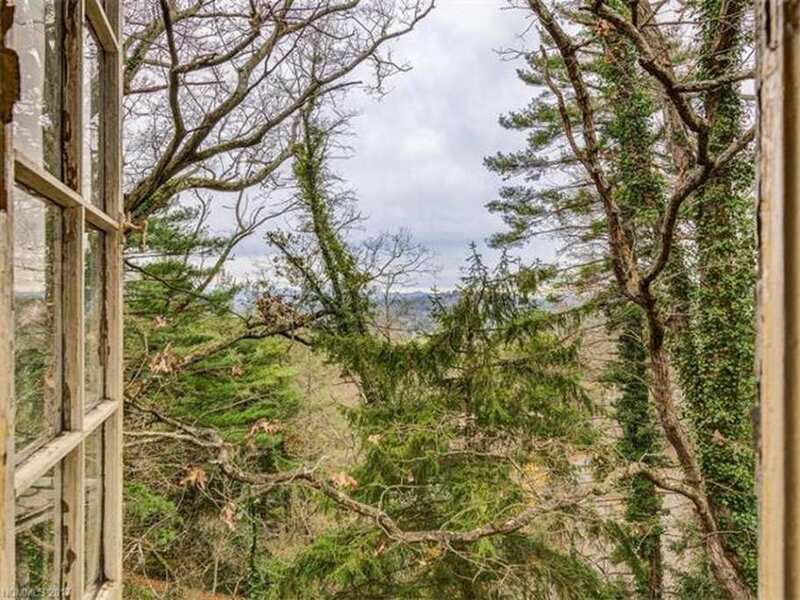 Potential is amazing - winter and potentially year round mountain views, low maintenance wooded landscape in wonderful Grove Park location just off Sunset near Grove Park Inn and 5 minutes to downtown. Thanks Linda M for sharing! 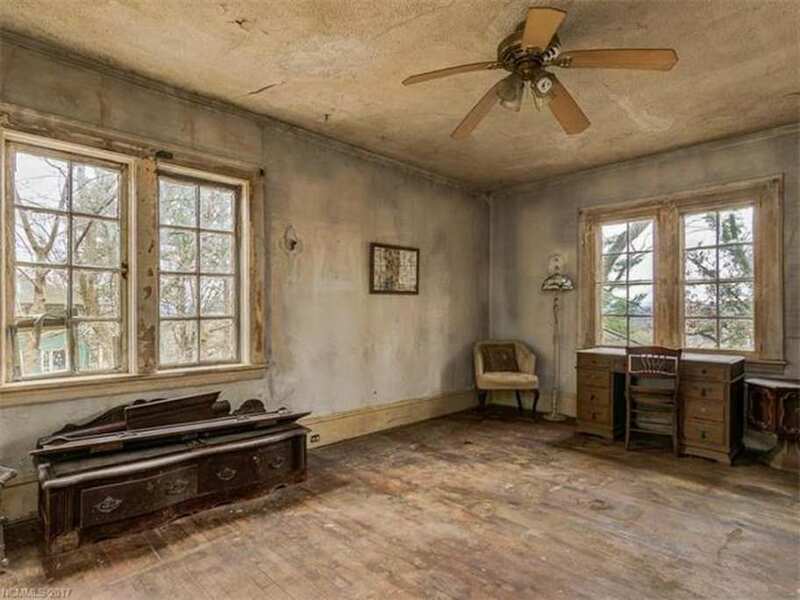 The sooty, crumbling wall plaster and the damaged ceilings should indicate a house long abandoned, but this house still appears to have been recently occupied. The kitchen is neat with a clean table cloth on the little table, and a fresh roll of paper towels hanging over the sink. The formal living room has some lovely old furniture attractively arranged with decorative items on the tables and mantel and pictures on the walls. 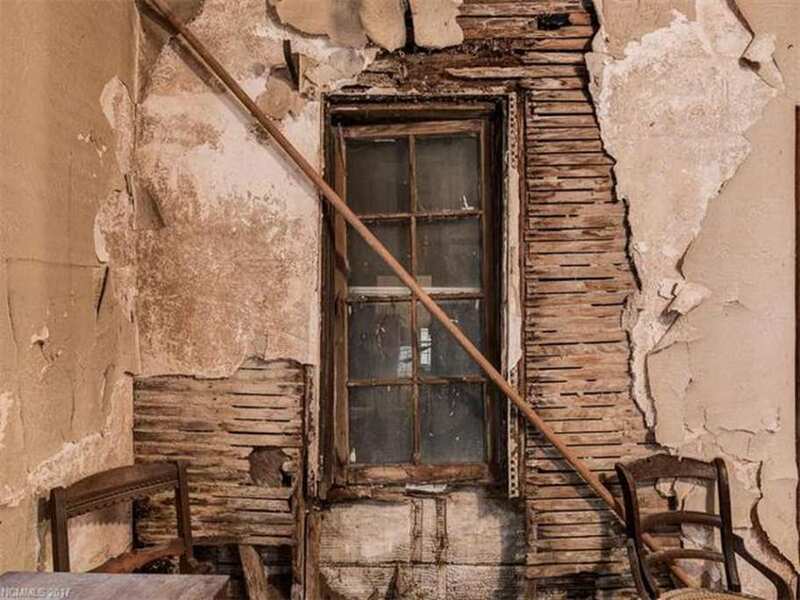 These interior photos don’t show the usual dirt, debris, and discarded junk of homes with this level of deterioration that are posted on this site. 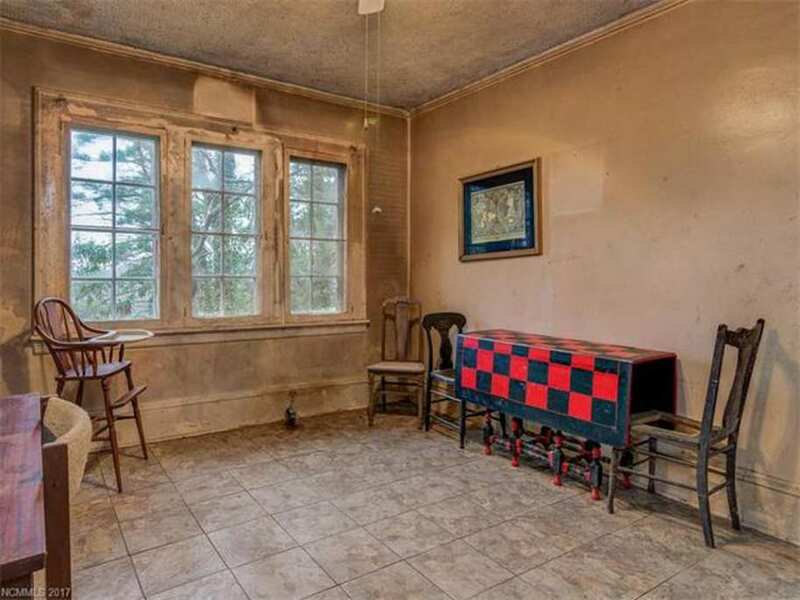 Is this an estate sale, or has someone taken the time to clean up a few rooms and stage them with the existing furniture? I think it has been cleaned out and staged. Yeah, the interiors look ready for an Anthropologie catalog photo shoot! This beautiful house is back on the market $325,000. Wow! A bit of elbow grease and professionals who know what they’re doing, and you’d have a gem on your hands. I hope that bathroom doesn’t get changed too much. I love the tile. I want to find some of that to use in my 1935 craftsman bathroom when I redo it. This is absolutely wonderful in every way to me! Wow, wow, wow. So much potential! 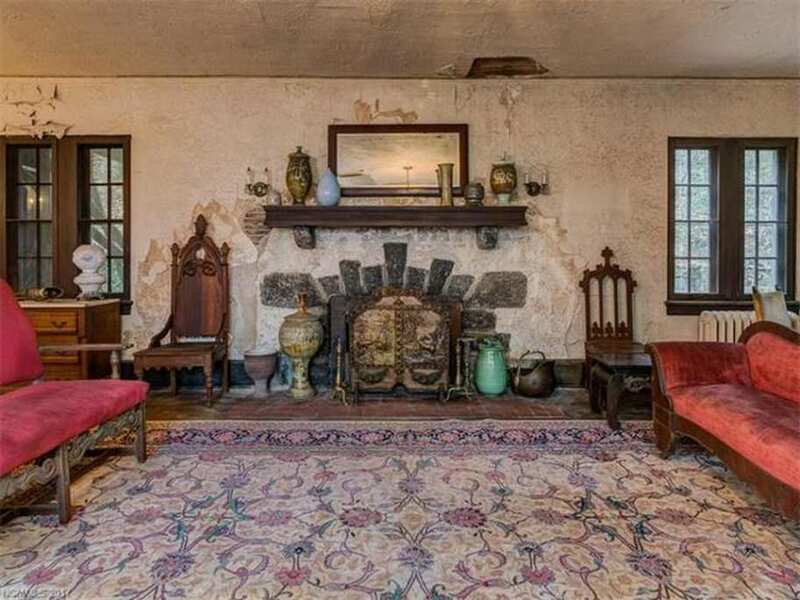 Original bathrooms, that fireplace, the wonderful shingles (they look in very good shape, are they slate??). I am wondering if the experts could weigh in on how that plaster could be repaired. Obviously someone would need to put a lot of money into this but it’s a fairy tale house in a lovely city in one of the most beautiful parts of the country. Home prices are very high there, which I am sure reflects the price. loose plaster repair is a simple process in some situations. However, you first have to determine the cause of the problem. If its simply an area that has come loose, we use a specialty washer about one inch in diameter that will grip the plaster. To hold the washer and pull the plaster back to the lath, we use a 5/8″ drywall screw, being sure to secure the problem area to the lath. Depending on the size of the area to be repaired, its not unusual to use fifty fasteners. Also, you have to remember we are working with three layers of plaster. This in includes the first base coat that locks this coat between the lath. The second coat is a scratch coat and this coat is used to secure the final coat (finish coat). This is only one solution to fix a loose plaster problem. Several pictures show a severe problem with missing plaster and therefore, there are other avenues we can use. Rog G, I know there is no way of telling exactly the cost without going in but do you have any idea of a price range you think this could be restored (the serious stuff) for? We are moving to this area and I love this house. Wish it had more land though. Sorry, quotes are not allowed here. There’s something about the wood showing through the wall with fallen plaster that I love. But I’m pretty sure that’s a very bad idea to maintain. With some love, this could be amazing, again. I bet she was a real beauty in her day. I hope someone can restore this lovely old home. Wow! Even in it’s current state, it is stunning! I am a sucker for woodwork and plaster. One of my faves from this past weekend. Once spiffed back up into shape, will be stunning vs. ‘just’ a very cool house & grounds, w. great views. What a fabulously strange house! It appears that you park on the street, then climb down a rickety wood stair, and then…where is the front door? The condition of the house would not faze me but the setting/situation is…interesting. Actually I think you park at the bottom. If you plug the address into Google Maps there’s a little stub there. Then you walk UP to the house. I might be wrong. It’s all quite confusing! I still think the front is below street level…the front is clearly in the first two photos, and the back is down below (I see what you’re saying about the “stub”), and we look up at the back on pics 3, 4, and 5. There are several houses on this street that are situated in this same strange way. Afternoon Katie and Everybody I am pretty sure you are both right. The front or what is used as the entrance now is in photo 2. It has a set of steps down(notice hand rail)then a small terrace or landing then steps up to the door. If it was raining or snowing you would use the upper walkway to the door. I am hoping I don’t sound like a know it all. My other half has a condominium on a canyon in Austin TX. The condos were built in the 80’s and are located on the upper rim of the canyon.When they were built part of the restrictions and why the city allowed a build on the canyon was no invasive buildings could be built.This of course meant building while not disturbing or as little as possible the trees or vegetation. The end result was beautiful condominiums fitting the canyon. We have cedar trees growing up through carports.I am mentioning this because to some people it would seem really strange or odd to have steps down then up and 15 or 20 foot walkways(as we call them gangplanks) to get to your condo. I would assume that as a part of the Preservation Restrictions mentioned above their rules are the same way. When people started building on the mountain they had to have something in place to protect the mountains and environment.Thank God. It also must be some sort of building thing that what is considered to be the front or even the front door is technically the back. This house has several areas that are like my friend’s condo. The carports are located in what you would think was the front of the condos. The condo entrance is there also but according to the condominium’s deed and official papers, like this house this is really the back of the condo. The front again like this house is the part that faces the canyon and in this case the valleys and mountains. Isn’t that interesting. Google street view indicates that the front door is opposite some sort of terraced or landscaped wall that leads up to the street. It would be interesting to see how that works in a rain storm, though, as their doesn’t seem to be curbs or any drainage other than the grade of the street–perhaps that’s enough. That’s the driveway with the stone wall, which may have led to a garage below the house that’s gone now. I imagine the view was attractive when the house was built and justified the odd site layout. The house has been owned by a woman since the 1970’s who apparently hasn’t kept up with the maintenance so well. I see a lot of potential. The stone walls and some terraced landscaping could be wonderful, and a better entrance arranged. The interior has some really nice revival features. Front door is in picture 5. Obviously the wooden bridge was added for convenient access since the original seems to be the stone stair I would bet the owner lived there as long as possible and it would appear remained independent and proud to the end! After spending a VERY large amount you’d have a beautiful house. Sometimes there is rear auto or services access. As someone else said, I also get the impression that the furniture was the owner’s, but that the house has been ‘cleaned up’ in order to look uncluttered. If staged – which I doubt, they did an amazing job of finding furniture which ‘fits’ the house! The rear stairs are for visual effect, not for bringing in groceries! I’ve been in parts of the house. The “clutter” you all seek is in a side room on the bottom floor. Literally PACKED with stuff. Can’t walk through. The house originally came with a catwalk. 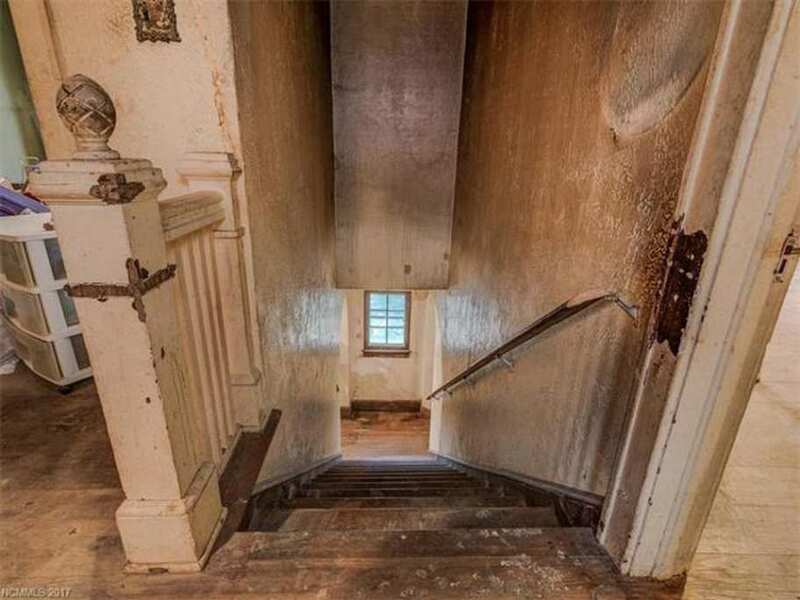 There’s stairs on the side that goes down and leads to a side porch off of the kitchen. When I went to David Miller Jr High I wasn’t allowed to take the bus due to the stairs at the back /front of the house. I grew up in this house, 1966 – 1975. I’m saddened by the condition of this house. At one time there was a catwalk that connected from the street to a door on the second story that took you to a hall and the bedrooms, 2 bathrooms, a linen closet, a sitting room that had been used as a small bedroom then you went downstairs dining room was to the left and living room to the right. In the dining room was a swinging door that took you into the kitchen. 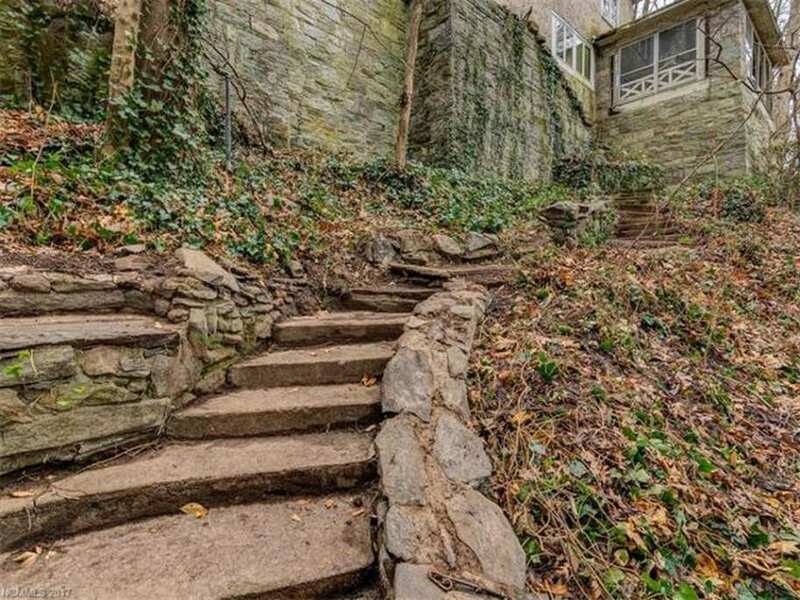 There’s stairs that took you from the garage / Street that lead to the kitchen and more stairs that went to the basement. At one time there was 2 bedrooms and half bath. I slept in the bedroom that opened to the yard in the summer. Denise – do you have any photos from the time you lived there? It would be nice to see it in better days. Any of the furniture in the pictures from your time there? 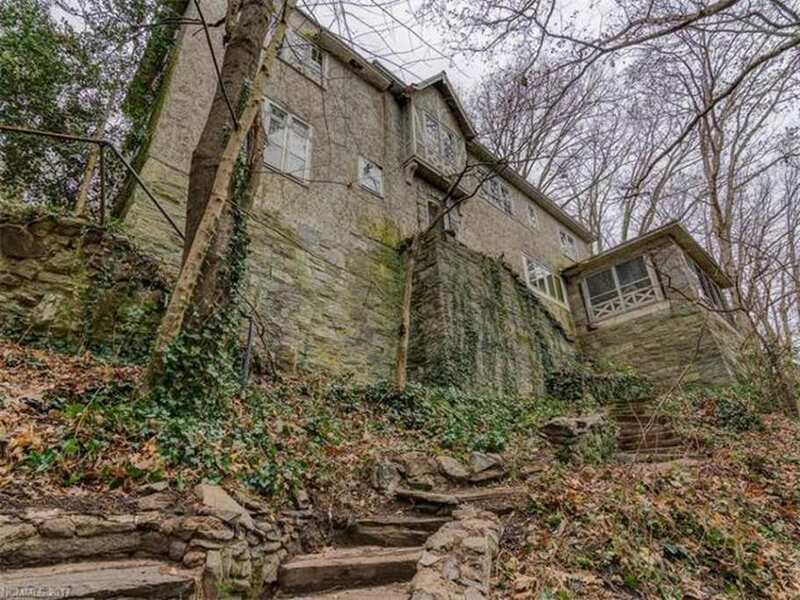 I’m really intrigued by this house, but this is one that really needs a floor plan to explain how everything works on the hillside. I LOVE the dining room with the extra height and textured cove ceiling. I’m wondering about the water damage – the roof looks new, so some work has been done (probably the most important bit actually). Water damage doesn’t always mean roof problems. If you are referring to the living room ceiling damage, that’s the first floor. Very true – but there are exterior walls with massive chunks of missing plaster in what look to be a lot of rooms. They look like more than plumbing leaks (unless the house was empty and pipes froze and weren’t caught for a long time). What a stunner. Imagine what this looked like in the 1920s. So much to love. I’m so happy that Kelly selected this house from the weekend posts…it was my FAVORITE BY FAR. 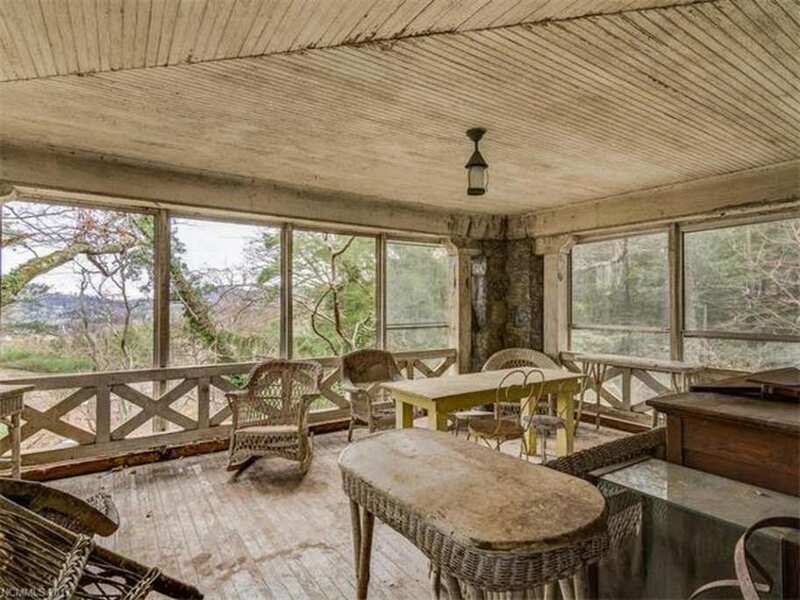 It looks like a Hollywood set of an abandoned house. I’ve rarely seen such picture-perfect ruination. I love the coved ceilings and the wrought iron work on both the chimneys. The whole concept of parking on the street and walking down to you house is pretty cool too…much like many homes in the hills of CA. Asheville is a great town with wonderful scenery. It looks like something from a storybook. I want to live there just the way it is. Oh My that back porch! That is where I would live!!!!!!! Alsoplustoo, I would want every stick of furniture. That black and red checkered folding table, the outdoor furniture on the screened porch, all of it. Wow. I am in love! It’s like a film set/ time capsule. Stunning. The impression of perfect ruination comes, I’ll bet, from the filter used on the photos. Without that, they might simply look sad. I wondered where shabby chic ended and neglected began. It sure is an intriguing house — I’d love to walk through it. I was enthralled and battling with my inner Miss Havisham until I too had that same realization. 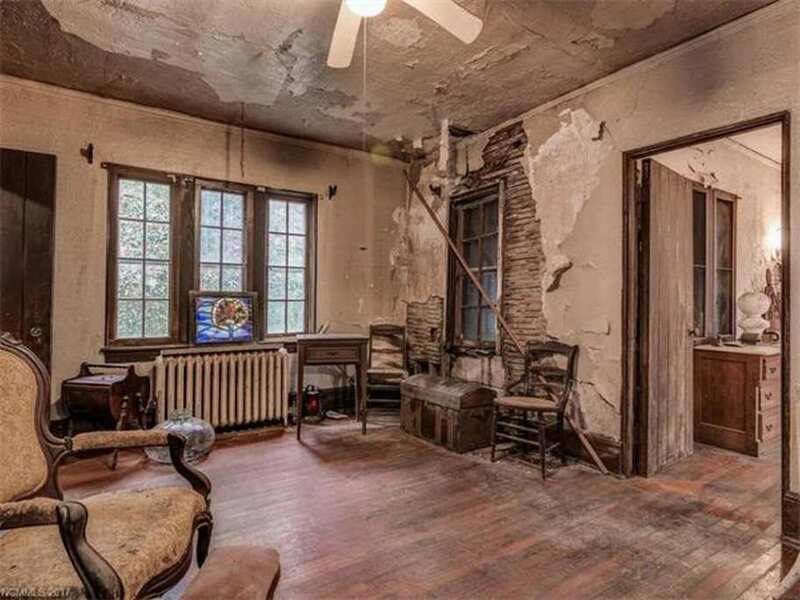 What looks like gorgeous decay is actually a really, really good filter. That being said, if I had the funds and wanted to move to a different state, I could easily see myself working to get this house fixed, and by “fixed” I do not mean completely cleaned up. I mean extreme shabby-chic meets fairytale. It could be done beautifully. It may be falling apart, but it is a beautiful kind of whimsy. I like it. Scary old dentist chair! 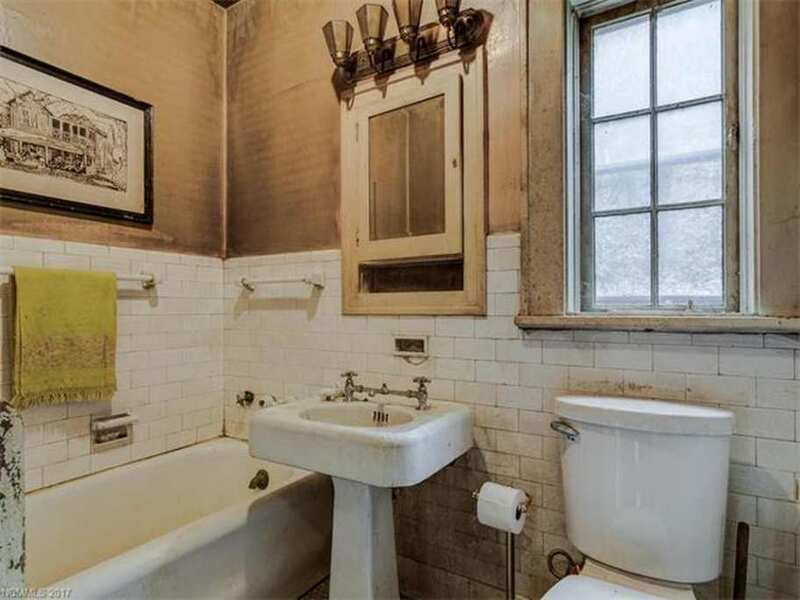 Scary old bathroom! Two of my favorite things. Love this house. I’m glad she chose it too, this house leaves people really guessing. If it’s all staged, it was done very professionally. No it was not staged the living room furniture I grew up with. Along with the wicker furniture in the screen porch. I was responsible for sweeping the screen porch as a child. I didn’t see the dragon wood box seat. It looks like an Andrew Wyeth painting! I love it! 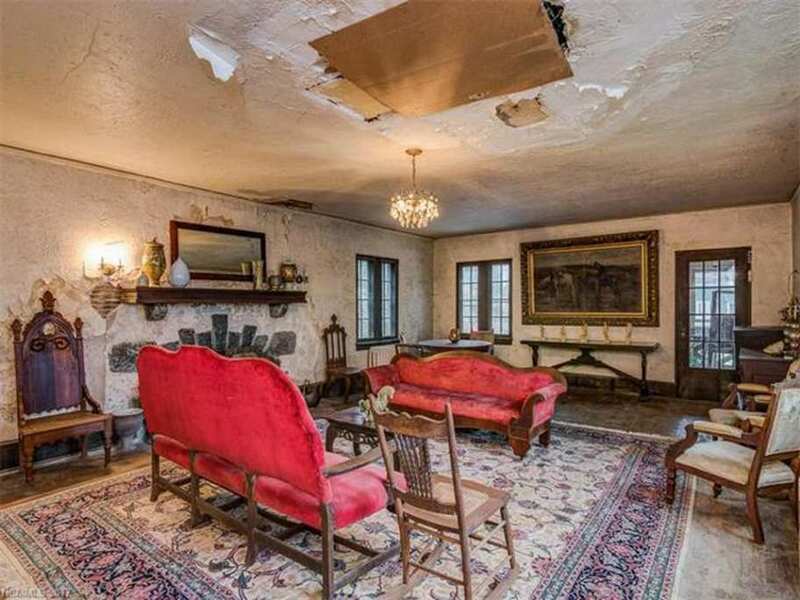 Reminds me of Grey Gardens…sort of. I love it. @Jane Maxwell: Beat me to it — that’s the same image that came to me! I had that thought, too! But then my imagination ran away with the Miss Havisham parallel (as stated above) and it seemed a better fit. What a historical gem! Looks like this house has served its past owner well. I was thinking the same thing. Even wondering if some of the rooms were paintings. Interesting still life photos of a beautiful old home. 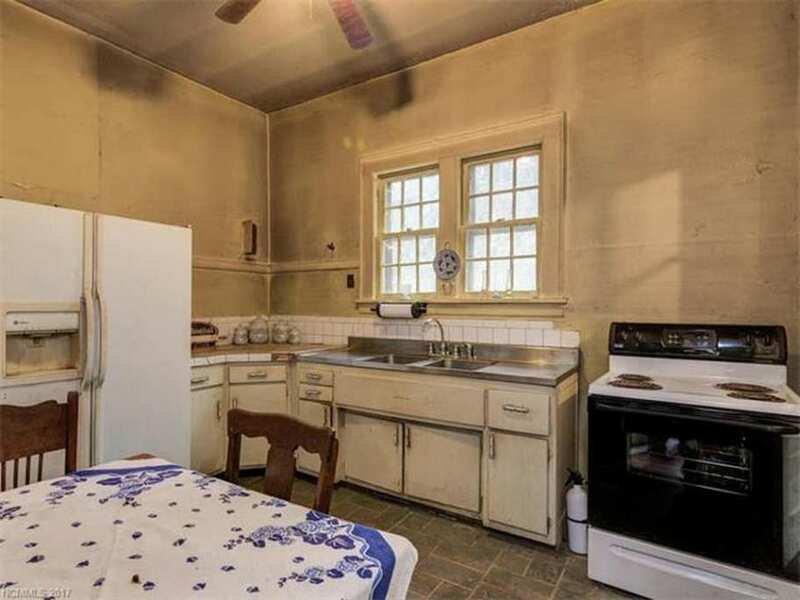 You know what I would do with the kitchen? 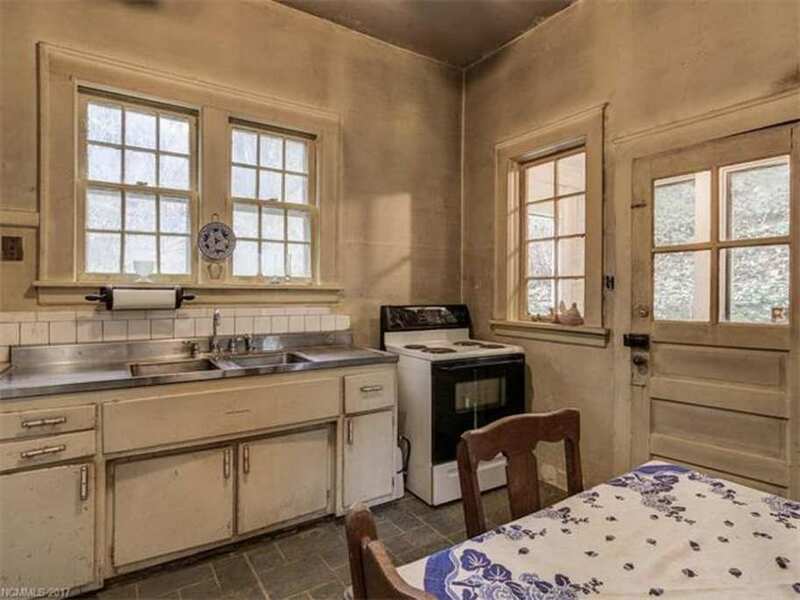 Put in casement windows, and replace the stove and fridge with circa 1940s appliances. And paint. Otherwise I wouldn’t touch a thing in this sweet, cozy room. MY GOODNESS such a mystery house! Shabby chic! It brings to mind Miss Havisham’s. Ashville is a beautiful place and real estate there commands top dollar. 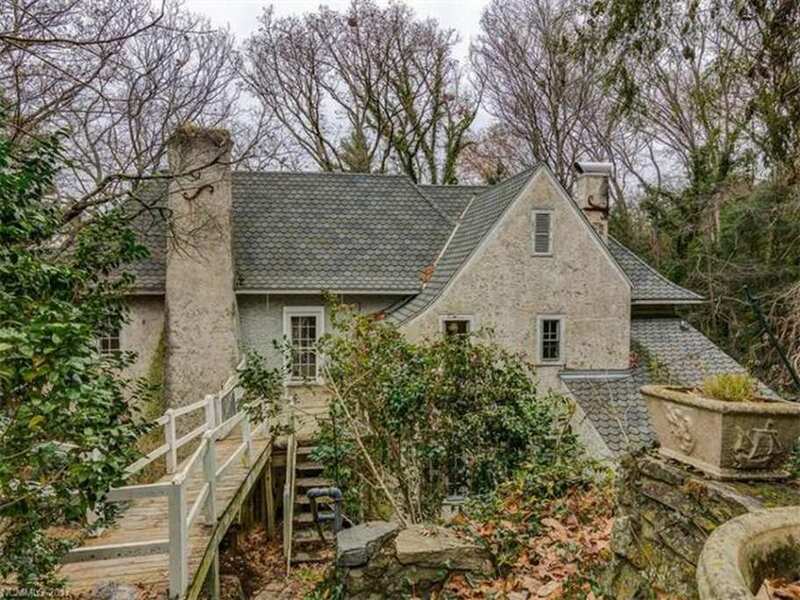 Would be nice to save that slate roof if possible. The flashings and underlayment are toast at 100 years old so pulling it all up and then relaying it with new flashing and moisture barrier would be the first place to start. Unfortunately roofers don’t like to guarantee that type of job. And they would probably get you for $* to do it. Would there be mold issues in the walls that could create some real problems? I would wonder. But all that said I love tudor revivals and this one oozes charm. It is in the right location for someone to justify the expense of restoration. I don’t think it was staged, but the furniture there from the owner, maybe with some stuff removed. and yes, what was it when it was in it’s hey day! picture 18 – at the top of the stairs shows regular “stuff”…………I think the place was tidied up. What a gorgeous house and property for a scary movie! I found it mesmerizing. I could look at the photos again and again and still find something new to marvel about. I so hope someone is able to rehab. it and cherish it for one hundred more years! I’m jumping around in my studio—-totally in LOVE with this one! Tudor is my favorite and this one, well, doesn’t it just make you want to roll up your sleeves and get started? 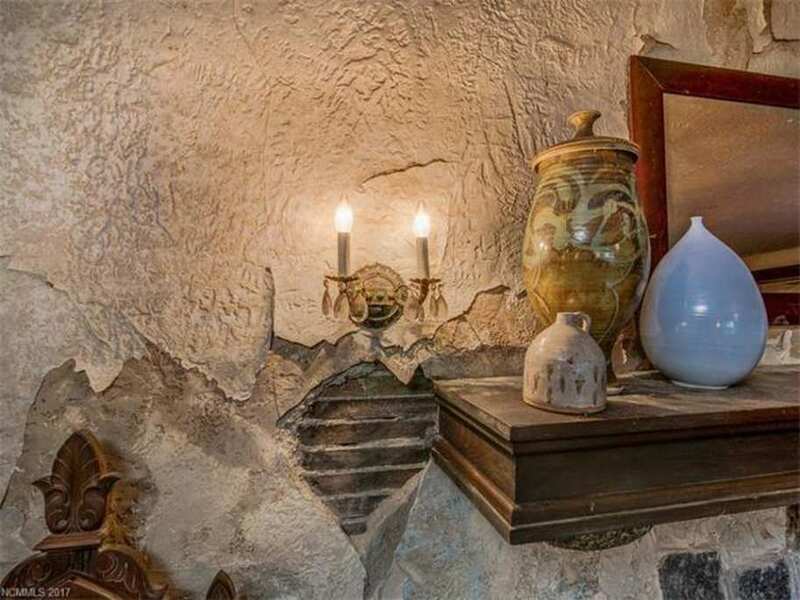 It might be hard to find a plasterer with old school skills, but it would be worth it. The huge fireplace in the livingroom. 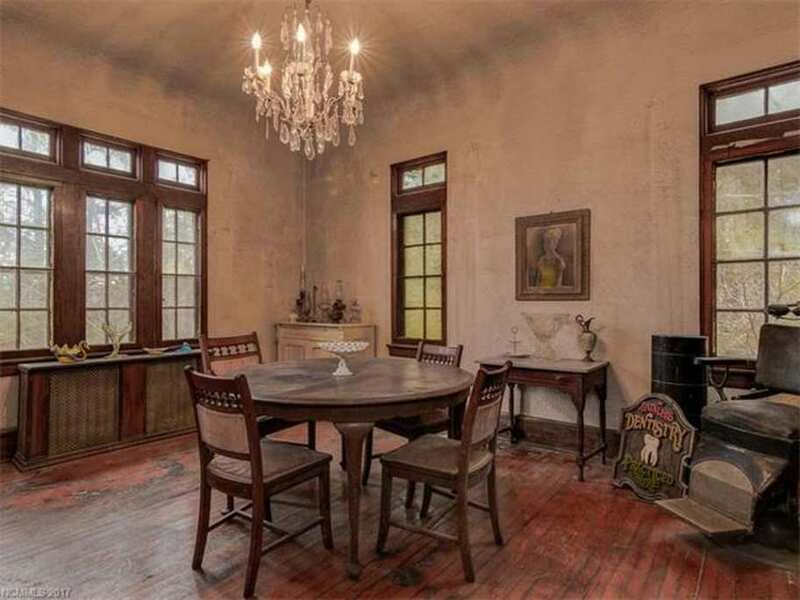 *sigh* Just ignore the realtor’s advice about remuddling; take what’s here and restore to original grandeur. I agree with Daughter of George above, the kitchen is perfect the way it is (except plumb with gas). Clean, paint and some retro appliances. Boy, I wish this house was near me. Dang. Afternoon Kelly and All::I am sorry for these long post. In the movie “Silence of the Lambs”Clarice M. Starling “Jodie Foster” is told do not let Dr. Hannibal Lecter (Anthony Hopkins) get in her head. I am not sure why but this is what has happened with this property. I have been off work for a few days and I am a member of Ancestry.com and a couple of others also. I enjoy researching and people say I missed my call I should have been a Detective. When I first read about this house last Friday it may have been Kelly having those wonderful but sad photos. 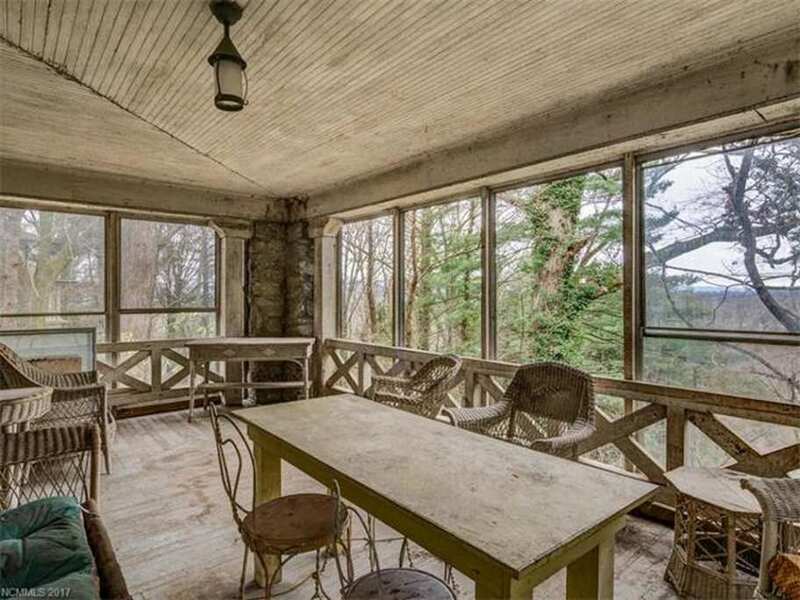 I started looking up information on “1 Fairmont Rd, Asheville” . The story that this house could tell involves mystery and broken hearts. I have started a folder on my computer(supporting documentation)to at least get this house out of my head. I think I am not supposed to use names so the woman that owns the property is living elsewhere and 89 years young. In the early seventies she was divorced and never remarried. The couple had 1 biological daughter born in 1949 and a son that by his age and hers must have been adopted.The son was born in Sept.1981 and was a deputy for Buncombe County NC. I am still researching what happened for my records but according to the local paper the son who was only 27 passed away unexpectedly at his residence(1 Fairmont Rd, Asheville) Saturday, January 3, 2009. In some of the photos on Google the road where people park is the son’s truck covered with a truck cover as late as 2012. That is when his mother went to live elsewhere giving her daughter and son in-law Power of Attorney. I am pretty sure the furniture and other things belongs to the mother,look at the green chair to the left in photo 15 also check out the portrait in the dining room photo 10 and the large painting in photo 7 and the Baby Grand Piano in photo 6. It is amazing no one has broken in and stolen some of these things The daughter lives in California and married to a doctor so it looks like she has no interest in any this except to get rid of all these things for her mother. I have been told that with an elderly person selling their home it is a very personal decision.If they can afford to keep the house while adjusting to their new life let them decide when to let go and sell the house but do not try and rush the mother or dad. There is a good virtual tour on the Ashville preservation society site. I got to it when I googled the address. Yes the son was adopted. I was a foster child of the owner of this home.along with a brother and sister The daughter was a dentist, therefore the dental chair. 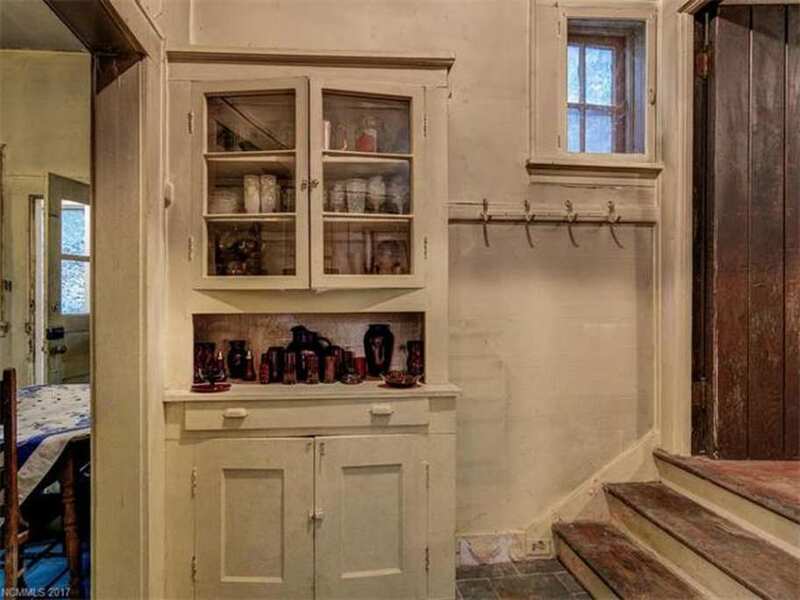 Love the cupboard in the kitchen by the stairs….so quaint. This is an amazing property. 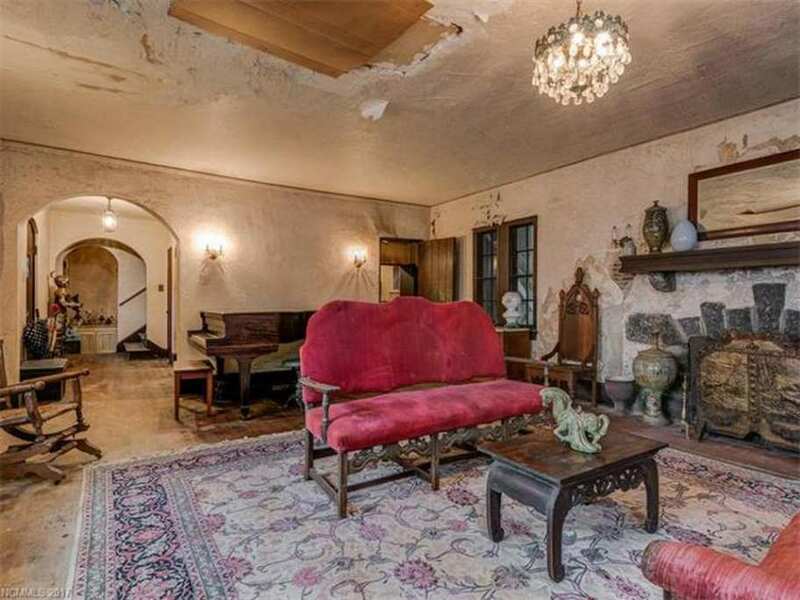 Reminds me of Grey Gardens in the Maysles documentary, or at the very least a movie set. Fascinating! I am a pretty big fan of the tudor revival (when not dark and foreboding inside) This home has lots of natural light and the hillside location enhances the interior lighting more. I Love the lines of this house and its setting makes it even more intriguing. This is one of those houses that is going to stick in my head for a bit. Sure would be nice to be able to see other views of the exterior too. I’ve seen some listings that post photos that have been taken by drones. On this house, that would be cool to see. This house makes me feel a little crazy. I think it’s a combination of the Addams Family staging right up against wildly caving ceilings and walls, plus some kind of photoshop enhancement somebody’s done to the photos that makes them look even more surreal. It looks like quite a challenge. I hope someone feels up to rescuing it. It ain’t me, babe. Not that I wouldn’t like to, just too much for me. Asheville is on the higher end for these older homes.. 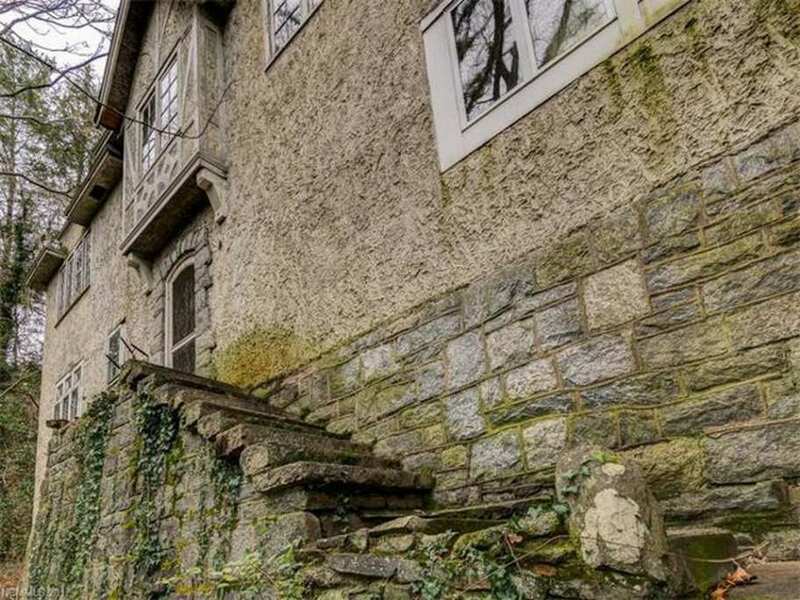 I personally am disappointed in the condition for the price.. but then these homes go for over a mil….it’s such a cool and interesting home.. it’s such a terrible shame that it’s condition is so poor.. it’s bad enough SEEING what you can see, I can only imagine what is NOT seen that you would have to deal with. YIKES…one would really have to have a deep connection with the property as well as pockets,…hehehehee.. but all fixed up.. it would be the bomb!!! Location, location, location! I drove by this house the first day it was on the market. Took my contractor husband by there the second day. (I’ve been back by 2 more times) We talked about it for 2 weeks. It is beautiful but we decided exactly what you said; our pockets just weren’t deep enough to do what needs to be done and what this home deserves. I’m honestly surprised it sat for as long as it did before an offer was made. I still dream about it! I love Tudors and Asheville. With a bit of vision and lots of money this place can be brought back to its original beauty. The living room ceiling with the big hole reminds me of an episode in Breaking Bad. If you watched the show you will know what I am talking about. Or perhaps Norma Desmond lived here. Wow what a dreamy sort or mini castle! Needs so much work but the grounds and stonework supporting areas around the house. Doesn’t hurt to dream. Loved it! This definitely has to be one of my favorites I’ve seen on OHD. I, too, would love to fix what was needed to make it inhabitable, but would leave whatever else I could. I love the crumbling plaster and water stained walls. 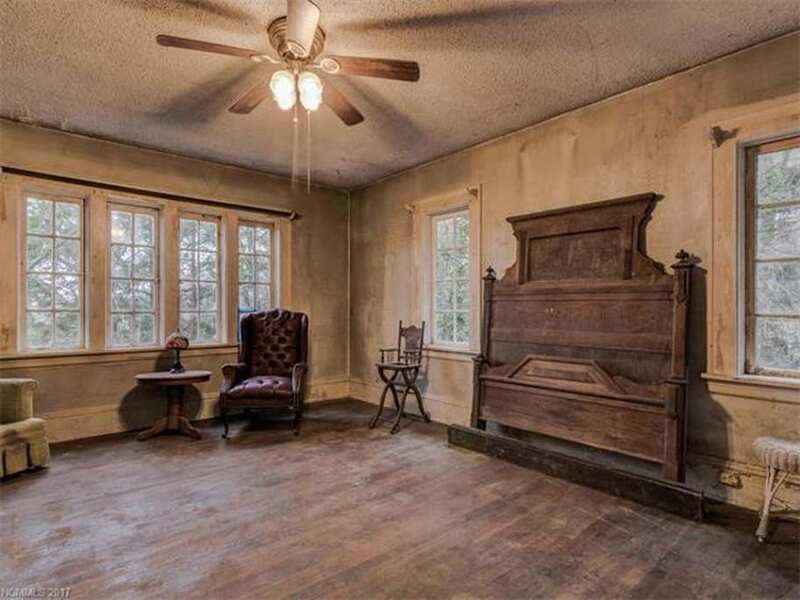 Add that to the well worn floors, left-behind antiques and general spooky ambiance I’d be in heaven. If this home was staged I want to hire the decorator! This is one of my favorites as well…. I can’t stop looking at it! So, I have daydreamed about this house since I first saw the listing and made a point to drive by last Friday while visiting Asheville. I was born and raised at altitude but the series of switchbacks we took before reaching the house was daunting. And then,there was no place to pull in or over and walk by. Place is socked in by vegetation; I’m not sure how the exterior photos were taken (winter vs verdant August, maybe). For sale sign is up, lights were on and windows open, and we could hear people talking and working (but how did they get in or carry anything in?!). I’m glad I saw it because it ended my crush. Oh, my heart! If it belonged to me, I’d only go so far as to make sure it was clean, functional, and sound – I’d never want it to be shiny/glossy. The feeling this house gives me has an emphasis on quiet and reflection, so I’d want to make sure that you could still see where time had left its fingerprints. Love it! we live in Asheville in a 1901 Colonial, and are going to see this one. I will report back! I walked the home. With a huge budget and lots of time, energy and patience one might return it to being beautiful. Built into a steep sloping site without parking I am not sure how one brings equipment or materials to the home or even where the construction staff parks their pickup trucks. Where does one park a dumpster? How does one remove construction rubble besides hand carrying it up the hill and then were does one put it if here is no dumpster? Hard to get good construction news in busy Asheville making scheduling hard. Come to this potential gem with a fat bankbook that you are willing to make very thin. Normally, one can get a permit to place a dumpster on the street. Also, downhill from the house, there is an extension to Fairmont Road, and right behind the house. Perhaps the dumpster could go there? And then a chute could be built to easily drop debris down to the dumpster. This street extension might also be ideal for construction truck parking.